Go to Care of Magical Creature class here. Joan had been unpacking in the morning and was excited about her fist class. Care of Magical creatures was her favourite class. she was so excited she got out early. and was out before the rest off class was. I got in the classroom and saw Joan already sitting there, waiting for the lesson to start. "Well hello, Joan. I see you are exited to start" I said smiling. I unpacked my stuff and started writing on the blackboard. one of the most beautiful and mysterious creatures. Aminia was walking to her care of magical creatures class after breakfast, walking slowly but not slow enough to be late. As she got to the door she noticed some girl she had yet to met, and the professor were already in the class. "Hello professor, I'm Aminia Black" she said shyly, as she took an empty seat in the back of the class. "O hello" I smiled. "Nice to meet you." "Well... I'm already going to start teaching. So take a seat." I said friendly. I was a bit nervous, because it was the first time I was realy going to teach. "So... like I already wrote on the blackboard, we are going to talk about unicorns today. Though the modern popular image of the unicorn is sometimes that of a horse differing only in the horn on its forehead, the traditional unicorn has a Billy-goat beard, a lion's tail, and cloven hooves - these distinguish it from a horse. 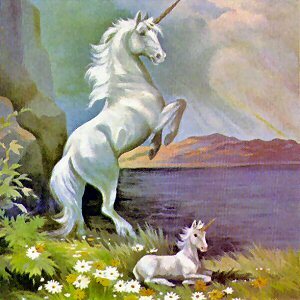 The unicorn is the only fabulous beast that does not seem to have been conceived out of human fears. In even the earliest references he is fierce yet good, selfless yet solitary, but always mysteriously beautiful. He can be captured only by unfair means." I said. "Muggles never see unicorns. because of that, they think they don’t exist. Humans think there is only one unicorn: the Narwhal, a dolphin with a horn on its head." I said, looking around in the classroom. "like everyone knows, is it a monstrous, unforgivable crime to kill a unicorn, tough its blood can make a life elixir. The blood of a unicorn can keep you alive, but against a terrible price. You’ll live a cursed, half-life." I said, looking at the reaction of the students. "does anyone knows what the horn of the Unicorn is famous for?" I asked to the students. Aminia sat up straight and noticed there were only two people in the class, she was confused but didn't care because she was anxious, she noticed some writing in the bord, Unicorns it said, she was excited to learn about them, " What beautiful creatures they are" she thought to her self. Raine ran to her Care of Magical Creatures class, hoping that she wasn't late. "Am I late?" Raine said, trying to catch her breath. "Well, Raine you are a bit late. but it's just the first lesson and I'm not gonna make a problem of it" I said and winked. "Well... are there any questions?" Raine sighed with relief. "I promise I won't be late again." Aminia raised her hand, "What are unicorn hornes used for?" She asked, she felt emmberresed for not knowing the answer. "I was wondering why muggles can't see unicorns. Is it because they aren't magical or something?" "and some people say that they have great medicinal powers. It's just not so easy to proove, because unicorns are very rare." "Unicorns just don't come in forests where Muggles live. They would always be bothered, won't they?" I asked smiling. "Have you ever seen a unicorn?" Aminia was taking notes left and right when she heard Raines question, she looked up, she never thought of that, she was courios to what the answer was. She was shocked at what she got, it was such a simple asnwer.